Watson Dairy Consulting can work with you and your team and local Dairy Architect to design a world class milk processing plant. We work closely with our clients and their engineers to fully understand your needs and ensure that local legislation is complied with. Why use a Dairy Factory Design consultant - This is a significant spend and there WILL be savings to be made both in construction and operation by having a dairy consultant experienced in the latest Dairy Factory Designs to work closely with your team, guiding and helping with decision making and paying attention to detail. Getting it right first time. The detail is very important and often overlooked e.g. design of doors, change rooms, laboratories, floor and wall finishes etc. We bring with us global expertise and knowledge of the latest resources and techniques to ensure that the best possible solution is met. We will see a project through from its early stage of feasibility sample feasibility for milk powder plant through to dairy staff recruitment, training and commissioning, when it is up and running and fully operational. Some examples of the work that we have undertaken can be found in our portfolio. 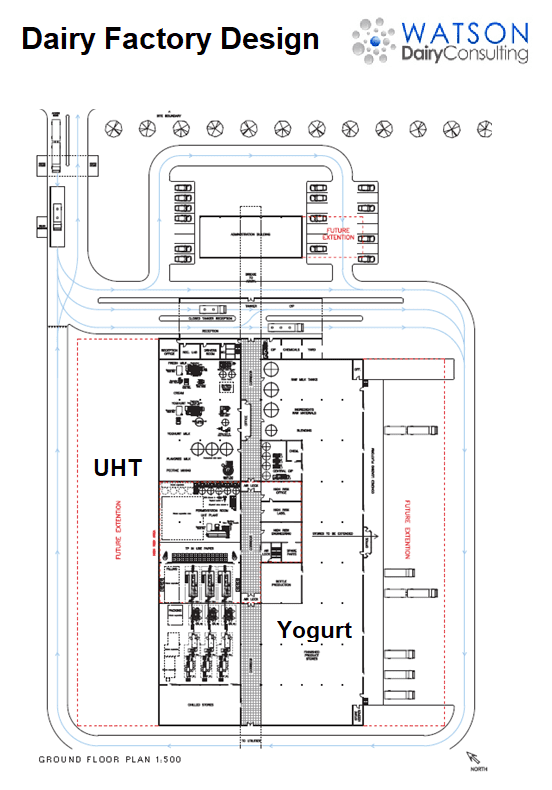 We provide consultancy and expertise on many types of Dairy Factory Designs, ensuring ease of operation. We take into account the activity level, the flow of people, vehicles, raw materials and finished products. We ensure personnel safety and strict hygiene controls by designing in high, medium and low hygiene cross overs points with minimal clothing changes. Air flows and pressures are calculated to ensure a positive air flow from high risk to medium and low risk. Window, doors, wash points, ledges, cills, ceiling, wall and floor finishes, drains, wet and dry areas are all paramount to good design.